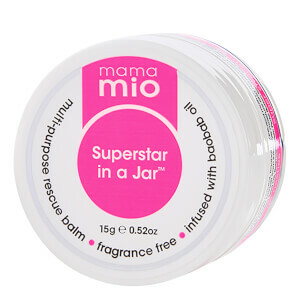 Wake up fresh or go to bed happy with Mama Mio’s Gorgeous Glow – we’ve got something for you! It’s a hard business growing a baby inside your belly. From the endless days to the sleepless nights, we know how tiring it can be. But you can now fool the world and disguise this with our Gorgeous Glow collection! During pregnancy, your safety is our top priority which is why we have developed the Gorgeous Glow range. We understand the need for effective skin care that does not contain harmful ingredients, so this collection is ideal for sensitive skin that is prone to unwanted outbreaks. Our No Nasties policy is a promise that we take very seriously here at Mama Mio. So you can be assured that our multi-purpose day and night cream will work hard to help prevent any unwanted breakouts. We understand hormonal skin which is why our mega-moisturising serum can help to keep skin looking bright and feeling fab! We have added pregnancy-safe lactic acid to keep skin looking bright and free from hormonal breakouts. Lactic acid gently exfoliates to free skin of dead cell build up which is one of the main causes of acne. Top Tip – Apply an SPF before your makeup during this hormonal time to keep melisma at bay! Our Gorgeous Glow Eye Serum will work hard to reduce the appearance of dark circles and brighten the way your skin looks with our yeast extract. This cocktail of refreshing ingredients can help to deliver deep moisture and improve the appearance of skin tone. This eye serum works to fight every fine line to help reduce signs of insomnia and keep skin looking fresh. Top Tip – If you have time, let the serum sink in before any other product is applied on top. Our lightly cleansing formula is perfect for delicate skin. With natural exfoliating ingredients, our face wash can help to reduce the appearance of blemishes caused by hormonal skin. Our hydrating and soothing facial wash leaves you smelling incredible and vividly fresh. Top Tip – Make sure you have a clean flannel to hand to dry your freshly clean skin afterwards.